Showcasing breakfast this fall, we love using our autumn inspired flavored balsamic vinegars like Red Apple, Cinnamon-Pear and New England Maple. In this photo, we serve Overnight Stuffed French Toast with Red Apple Balsamic Syrup, along with Red Apple Balsamic Glazed Bacon. For something oh-so New England seasonal and not typically something you see served every day or get-together – try our Honey-Ginger Mulled Cider with Honey-Ginger Balsamic. To all your blustery day feasts and Halloweeny endeavors – enjoy! 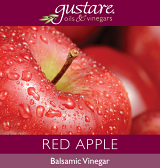 Red Apple Balsamic Ideal with fruit, apple crisp topped with toasted almonds, or a sharp, aged cheese.